When stools spend too long in transit – that is, in the large intestine – an uncomfortable condition occurs. Extremely slow digestion produces a lot of discomfort and the inability to defecate over the course of a number of days. In addition, it may cause abdominal pain, colitis, nausea and other unpleasant symptoms. There are a few factors that can provoke this illness: stress, inadequate liquid intake, insufficient dietary fibre, excessive use of laxatives or pharmaceutical products, hormonal changes or fluctuating lifestyle habits. In these instances, aloe vera – otherwise known as aloe – helps empty the intestine naturally, so is an effective remedy for constipation. Scientific studies bear this out. This remedy is easy to prepare using the aloe plant. First, rinse the plant with cold water. Cut it in half with a sharp knife, and remove the thorns. Then, extract the transparent gel and put it in the blender. This miraculous gel has laxative properties. Immediately process the gel because, once it is in contact with the air, it will begin to harden. You may want to add some citrus (lemon, grapefruit or orange) to the aloe before you blend it. This will help to preserve your remedy. The blend will stay fresh for up to a week if you keep it in the refrigerator, but it will be most potent during the first two or three days. Optimally drink 60 to 90 millilitres of aloe juice each day. Preferably take it on an empty stomach so that it doesn’t mix with any food or drink. This increases the remedy’s efficacy. You should take two tablespoons of this blend and stir it into a glass of water or fruit juice. If you have chronic constipation, you can consume aloe vera every day. However, you do want to keep an eye on your intake. In excess, even the most benign substances can cause contraindications or troublesome side effects. Note: this remedy is not suitable for pregnant women, diabetics or those with thyroid or kidney diseases. If you fall into any of these categories, your best bet is to stick to a diet rich in fibre and vitamins. The presence of flatulence and/or abdominal pain can be symptoms of constipation. If you’re experiencing either of these things frequently, you should see your GP or a nutrition specialist to get a proper diagnosis. What else can you do to get relief? Drink, drink, drink! Don’t get too excited. We’re talking about increasing your intake of good, old fashioned water. You’ll also want to consider healthy lifestyle changes. For instance, you may want to look at your dietary habits. Are you eating enough fibre? It’s a huge help to the digestive process, and, when combined with moderate exercise, will greatly improve your metabolism. 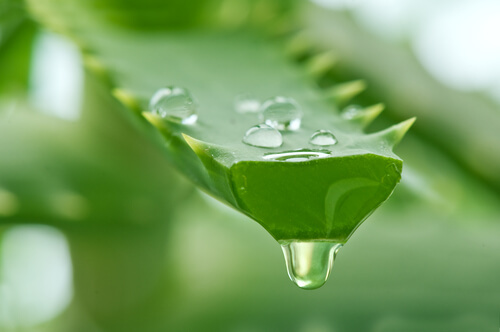 You’ll be hard pressed to find a plant as potent as aloe vera. It provides a multitude of beneficial properties. As previously outlined, aloe aids digestion, helps clean your colon and regulates the bowel. If you decide to use the remedy we’ve offered here, bear in mind that its proper preparation and conservation is paramount. This way, it will help address your specific health concerns quickly and adequately when you drink it. Watch for any reactions such as abdominal cramping or diarrhoea. If you notice either of those things, stop taking it for at least 3 days. When you start taking it again, take small doses three times a day and before meals. This will go a long way toward the relief of uncomfortable constipation. Fatty liver isn’t a disease as such: it involves the accumulation of fat within the liver cells in the body. This makes it expand and feel heavier! You shouldn’t be worried by all instances of inflamed lymph nodes, especially if it’s due to infection. However, you should be aware of signs of illness. This article will help you know when to consult your GP.